Giampaolo Tonello reports on the 2006 edition of the Romanian International Air Show, which took place on July 29-30, 2006. The Romanian Air Force (Fortele Aeriene Romane) celebrated this year 100 years of mechanical flight; in fact, fulfilling his dream of flying, the Romanian Traian Vuia performed, on 18th March 1906, on the field of Montesson, France, the first mechanical flight. For this event a big air show at the Mihail Kogǎlniceanu Airport near Costanza, 25 Km from the Black Sea Coast, was held. This airport was one of the main military airport of the Romanian Air Force: this is witnessed by the large quantity of MiG-29s and MiG-23s in the dispersal areas, sadly waiting their end. This time we had the great opportunity to take part to the event with both pilots and technicians of the famous Italian acrobatic team Frecce Tricolori,. This way we could live this experience from a quite different point of view. In fact, when you look at the beautiful evolutions of these fantastic pilots, you can never imagine how much work, people and machinery are involved in order to make everything go like a clockwork. The air show was planned as a 2-day show, occurring on Saturday 29th and Sunday 30th of August. 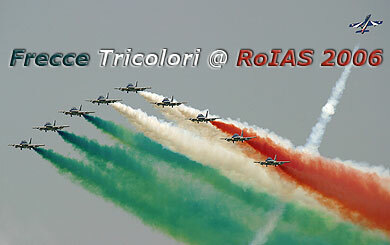 So our trip started on Thursday from Rivolto AB, homebase of the 313° gruppo Frecce Tricolori. Eleven MB339PAN left inbound Romania together with one C-130J from the 46° Aerobrigata; a 40 people contingent all together. For a transfer like this you need fuel supplies for three exhibitions: the flight trial on Friday and the two official exhibitions on Saturday and Sunday. Apart from personal belongings, 3500 kg of oil for the smokes and 4000 kg of spare parts were stowed into the Hercules. And I was inside it as well! At our arrival the military staff of the Italian Embassy and that of the Romanian Air Force greeted us with the wishing-well ceremonial of bread dipped into salt, then, after getting through the customs, we were led to our hotel. During the next three days the flight trial and the show itself took place regularly, with a big crowd attending the event: imposing air exhibitions culminating with our acrobatic team show on Sunday. The show started with some massive Fly-by of the Romanian Air Force culminated with the beautiful exhibition of the MiG-21 LanceR followed by the Dutch F-16 demo team, the French Mirage 2000C and the Swedish Gripen (maybe the LanceR’s substitute like in the Czech and Hungarian air force?). The aerobatic team display were performed from the Swiss PC-7s one, The Croatian PC-9s and the Turkish Stars. The Frecce Tricolori performance was so spectacular that the Romanian President, Mr. Traian Basescu himself stopped the exhibition for 10 minutes in order to congratulate personally the Italian pilots and staff straight on the flight-line. Special thanks to Luigino Caliaro and Stefano Trevisan who helped me attending this beautiful experience, all the Frecce Tricolori Team who made me feel “at home”, the SMA (Stato Maggiore Aeronautica) and the Captain Commander Liliana Tanase of the Romanian Air Force.